About ten years ago, my wife and I enjoyed a terrific bowl of tortilla soup at a cafe perched above the bustling streets of Cabo San Lucas, Mexico. I've been trying to reproduce it ever since; this is fairly close. The secret is in the lime juice, and the freshly made tortilla crisps added at the table. In a large stockpot, heat 3 tablespoons of oil to medium-high heat. Add crushed garlic and chopped onions, and stir until onions just start to brown. Add the can of crushed tomatoes, cumin, cayenne pepper, chili powder, salt, pepper, and half of the lime juice. Turn up the heat until it bubbles, stirring constantly, then gradually stir in chicken stock. Turn down to low and simmer for 10 minutes. (Optionally add black beans or fresh corn kernels). To make the tortilla crisps, julienne 12 corn tortillas into narrow, uniform strips. In a saucepan, bring 1 cup of vegetable oil up to medium-high heat (takes about 5 minutes to come up to temperature -- be sure to test the heat of the oil by placing a corn tortilla bit into the oil -- it should bubble immediately). Deep-fry these tortilla strips in batches (2 mins or so -- do not let them turn a dark brown) -- transfer to paper towel to dry. They should be crispy. 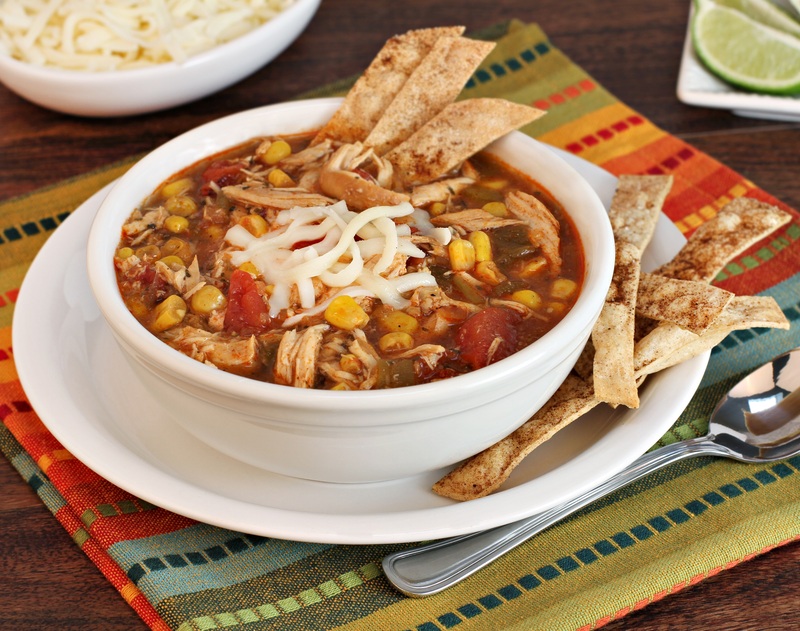 When ready to serve, plate the soup, then top with a mound of the tortilla strips. Optionally add avocado, sour cream, cheese, fresh corn kernels. Squeeze fresh lime juice into each bowl at the table.